It’s been quite a bit of time since I’ve made a true blog post. Things have been very exciting in my life lately and I’ve been chugging along to keep up with it. The first thing I’d like to talk about is the first thing that happened this year. Starting January 1st 2014 I became a Technical Team Lead at Apparatus. I oversee 5 technical resources while maintaining myself as a technical resource also. It is a new challenge and one I am very eager to execute on. This position has given me the ability not only to expand my technical knowledge across multiple technologies but also to gain experience in management. I am one of the first 7 people in this role at Apparatus and I get to be part of the formation of this new level of management and it is a fantastic opportunity for me to grow. The next thing that happened this year is the first time I’ve taught a Microsoft Official Course (MOC) which was the 20410, Installing and Configuring Windows Server 2012. It was a lot of work to prepare for this course; however it was well worth every minute of prep work as this was an extremely exciting course to teach. I had 12 people in attendance and I received lots of positive feedback on my teaching technique. The best part of that week was not the experience, or how much fun it was to present. 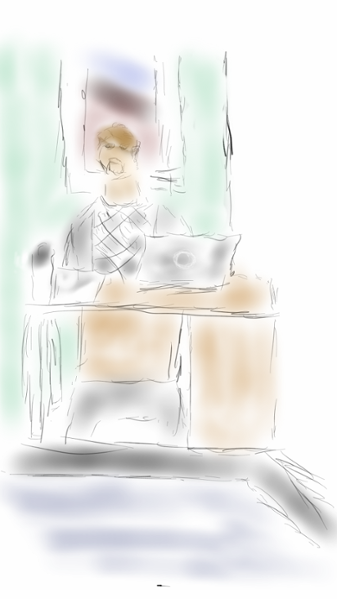 It was the fact that one of the students in the course decided to sketch a picture of me while I was talking about IPv4 Sub-netting which I’ve included below. Dude – way to go! Nice job, keep up the great work.